USAID LandLinks hosted “The Business Case for Land Rights: Results from the 2018 Investor Survey” on April 5, 2018. The webinar shared findings from the first voluntary Investor Survey on Land Rights and heard from the private sector about live investment projects seeking to create benefits for both shareholders and communities. There were more questions from the audience than could be covered during the webinar. Our panelists, Jeffrey Hatcher of Indufor North America, Finn Jacobsen of African Plantations for Sustainable Development and Oriane Plédran of The Moringa Partnership, along with our moderator Sarah Lowery from USAID, share answers here to some of the most interesting ones. Question: Might anyone be willing to share the ‘topical outlines’ you may have prepared to guide participants doing participatory appraisals of land issues, in particular regarding mapping traditional land ownership and use? Especially useful might be those used in the West African Sahel/arid zones. SARAH: LandLinks hosts the Mobile Applications to Secure Tenure (MAST) Learning Platform, which has great resources on the innovative technology tools and inclusive methods that use mobile devices and a participatory approach to efficiently, transparently and affordably map and document land and resource rights. 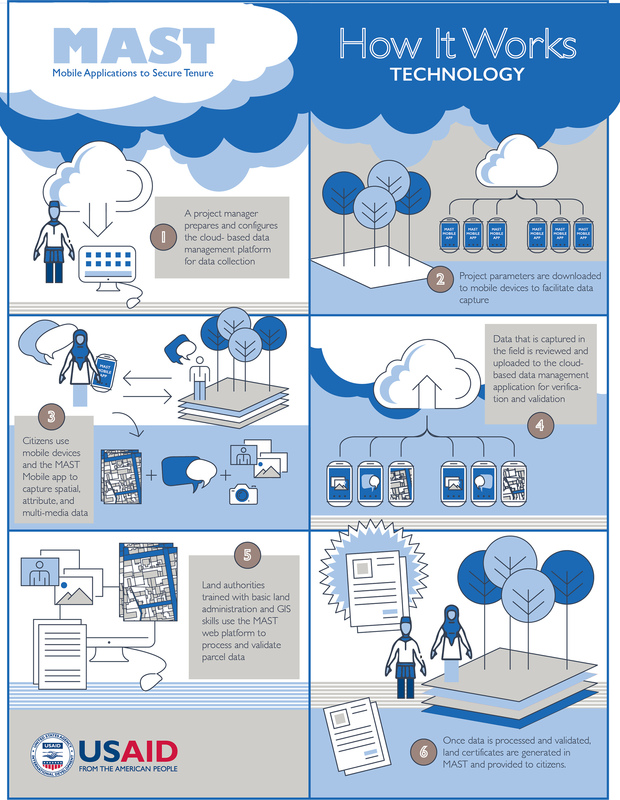 Check out the MAST How It Works Infographic and the Technology Infographic, for example. This New America blog also has a helpful description of the MAST approach. 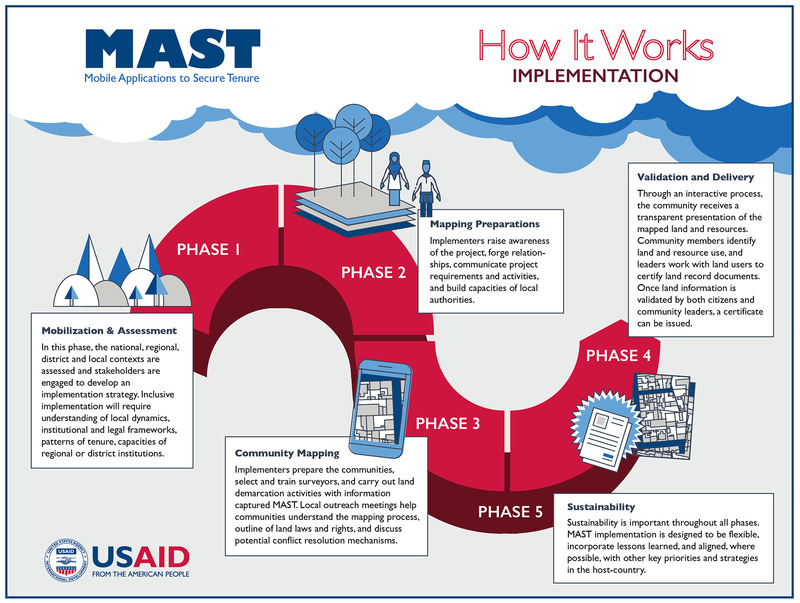 In West Africa/Sahel, USAID has piloted MAST in Burkina Faso with the National Land Observatory (ONF) with some impressive results: in only 25 days, 12 villagers used MAST to map and capture data on 2,708 rural land parcels. ONF’s local publication, “Zoom sur le foncier” (in French, also online), has a section on MAST. USAID has also worked with MAST in Zambia with customary chiefs to increase tenure security for treatment households, and USAID has demonstrated significant increases in community land governance from participatory mapping, creation of bylaws and related activities under the Community Land Protection Program in Liberia. Question: The civil society has been supporting the State and the private sectors to increase investment transparency by improving community consultations on land and other natural resources. What mechanisms should be created for local communities to be part of the investments using land as the counterpart? SARAH: There are many investment models that can create benefits for local communities. These range from 1) lessor/renter agreements where individuals or the community as a whole receive regular payments for use of their land to 2) revenue-sharing arrangements in which the community receives a portion of the revenue or profit of the investment to 3) joint ventures, in which the community actively participates as an equity holder in an investment. The latter can even work if the community does not initially put up capital but borrows its equity stake, to be paid back via the profit from the investment. FINN: This is a very important question but one with a certain ambivalence. Most of the land owners/caretakers have no or very little income from their land holdings. The main reason for this is that land matters are not managed well and the practice of giving out land plots to settler farmers, etc. is part of the informal economy. An annual lease fee payment will provide a fixed income for the tenure period. If well managed, this will improve their financial situation. Using the land as “equity” will make the land owners shareholders with all the obligations and risks involved, and if the company does not pay dividends the land owners will be stuck without an annual fixed income. I think that a two-stage processwhere they start as a lessor and then when the lease is to be renewed, a participation model could be negotiated, could be a good model. If the land is in the hands of government, an equity stake could certainly make sense. JEFFREY: Community-centric approaches, such as participatory mapping of land, development of grievance mechanisms, community programs and support to local communities to receive land titles, are essential for diagnosing and addressing land tenure challenges. The level of success of these mechanisms depends on how well the approaches are implemented. Using external service providers or working with local NGOs can be a good way to ensure effective and inclusive community engagement. Question: How can business approaches and intervention assist in curbing Land Tenure and Property Rights challenges? JEFFREY: Businesses can integrate land and resource tenure risk assessments into investment decision-making processes to identify the types of risks and possible mitigation actions. Furthermore, they can ensure projects plan and budget to address land tenure challenges, such as recruiting and training qualified staff on best practices for community-centric approaches, including systematic stakeholder engagement, grievance mechanisms, community development programs and participatory mapping of land claims. Additionally, businesses can leverage their existing risk quantification approaches to include better estimates of the land tenure risk impacts on investment returns, as well as quantify the benefits of addressing land risks and engaging communities such as reductions in their cost of capital, increased share price, increased revenue, etc. Why the other six communities did not respond? Was it distrust of an outsider, especially a corporate outsider? FINN: No, it was not. In the area where we are developing the project, the level of poverty is high and the education level is also below average. We concluded that they actually did not know what to ask for as their needs in general have been so low and they have very limited knowledge of what is possible. Further, the lack of a regular income leads to a passive approach from the local citizens. The request of four for hospitals and schools, even though they had such facilities or access to such. Do you think expected employment was the reason for request of the infrastructure—or something else? FINN: It was simply the easiest way to answer our request. Question: I missed how the 5,000 contacts were whittled down into about 75 respondents for Survey 1, and about 100 for another of the surveys. That could cause enormous self-selection, if a result of other companies not bothering to respond…OR some other sort of selection bias, if a result of someone choosing the respondents by criteria other than those listed. I would much appreciate your explaining the selection process. JEFFREY: For Survey 1, an initial list of approximately 40,000 relevant companies was generated using publicly available sources, which the survey team used to collect contact information for approximately 4,900 individuals working in relevant positions in those companies. The survey team sent personalized invitations to those individuals asking them to complete the survey and followed up with several reminders. A link to Survey 1 was also posted on relevant list-servs and USAID outreach communications. In total, 143 respondents completed Survey 1. After screening the responses against the qualification criteria, 75 of these respondents were deemed qualified, and their responses to Survey 1 are included in our analysis. These 75 respondents were selected to participate in the second-round survey. Of those 75 qualified respondents, 35 completed Survey 2. Those 35 organizations provided in-depth information regarding 102 projects worldwide, including 39 rejected and 63 undertaken projects in agriculture, forestry and renewable energy. The individuals responding to the survey on behalf of their organizations were all senior executives (C-suite or sustainability officers). Given the aim and scope of the survey, it is very likely that the organizations that responded to the voluntary survey would have a pre-existent interest, concern or commitment to responsible land-based investment. Additionally, the number of respondents from Asia and Oceania was relatively small compared to those from other regions. This report, therefore, only makes claims regarding the organizations that participated in the survey. It should not be interpreted as representative of organizations outside the sample, nor does it try to draw generalizations about land-based investment as a whole. Despite numerous efforts to generate as many participants as possible, the final sample size of the survey was modest. The response rate may have been affected by several factors. Given that this is the first edition of the survey, there was no reference point for potential respondents. The request for detailed operational information and length of Survey 2 may also have dissuaded some potential respondents. In addition, the timing of the survey—launching in late 2017 with data analysis in early 2018—coincided with several holidays, and the short timeframe limited possible follow-up efforts. The branding of the survey from USAID—a public institution—might have dissuaded some private company responses due to the sensitive nature of the questions. Lastly, many emails bounced back, ended up in spam folders or were never opened. It is notable, however, that once the survey was started, 77 percent of potential respondents completed the survey. Question: Work needs to be from the ground, the “bottom-up” approach with “top-down” support. However, in our experience, the chiefs were not sufficiently “on the ground.” Much too often, their personal benefits took precedence over those of the community. Did you encounter problems of chieftaincy corruption and [if so,] how did you deal with it? FINN: The level of corruption in the areas we are operating is low. We also informed all stakeholders from the beginning that we have a no corruption policy. In the beginning they still tried to ask for certain personal favors which we always declined. If they asked us to grade the road in a community, however, we agreed to do that. All stools have no approved mapping of the stool area, and previously the boundaries were described by large trees, creeks, large stones etc., but most of these “landmarks” have disappeared. It is always a challenge on how to split up the lease fee paid by African Plantations for Sustainable Development. The stool itself and the traditional council receives approximately 40 percent of the gross lease fee. One of our Stools has agreed to split the fee in three parts, one third each to the traditional council, the community and the youth organization. Question: Could you please explain how you can or do attempt to work with customary or traditional stakeholders to partner with them so they can become better stewards of the environment in Ghana? FINN: This is a huge challenge and we are talking about changing old habits and bad agricultural practices. Where we find these high levels of poverty there is no understanding [of or concern for the] environment, conservation and reduced burning. Our concept is to show as many farmers and stakeholders as possible that it is possible to do agricultural activities without destroying everything around you, but it certainly takes time. As I stated in the webinar, there is much talk about land use, but almost none concerning land abuse and the latter is a more serious challenge. Climate smart agriculture is one of the key concepts but that will also take time as it is still too much patchwork and not enough solid concepts around. Question: What would you consider as the main responsible land business standard? It seems that the Interlaken Group consider the VGGT as the primary one. JEFFREY: Indeed, the Interlaken Group has defined its view on company responsibilities to uphold the VGGT in commercial settings through its release of the Interlaken Guide on Respecting Land and Forest Rights. In addition, almost all governments have committed to the VGGTs, which require them to respect legitimate land rights. However, Indufor does not consider one guideline as the main responsible one, since the different guidelines focus on different aspects of land-based investments, such as agricultural projects, or inclusion of human rights. Overall, the challenge is for companies, operating in a variety of governance contexts, to put these guidelines into practice and internalize the guidelines’ principles. To do so, Indufor sees a need to iteratively improve these guiding principles over time, rather than calling for project abandonment as currently outlined in some of the guidelines and frameworks. SARAH: Similar to Jeff’s response, USAID does not see one particular guideline as better than others. I personally like the Analytical Framework for Responsible Land-Based Investments in African Agriculture because it is succinct (~16 pages), clear and practical. Of course we also have the USAID Operating Guidelines for Responsible Land-Based Investment. However, I would argue that it is much more important that investors and businesses are seeking to create projects that respect local land and resource rights and that benefit local peoples. If guidelines are helpful in achieving that end, fantastic. Question: What tools are available to support global business operating in weak land governance context to adopt full land and property rights due diligence strategy? JEFFREY: There are several tools to assist any company to perform a due diligence assessment. Some of these tools might be required by law, such as environmental and social impact assessments (ESIAs), and are often conducted by a third party. Other tools are additional, including an initial diligence assessment, participatory mapping, checking titles and land rights documents, which can also be performed by a third party. In the Investor Survey, we found that of the tenure risk mitigation strategies reportedly used in undertaken projects, those perceived as being successful in more than half of reported projects focused on stakeholder engagement, community development programs, participatory mapping of land rights, establishment of grievance mechanisms and support to local communities to obtain land titles. The strategies that succeeded in fewer than half of reported projects included working with government authorities, installing guards to protect plantations, employment of local community members and building fences around plantations. Approaches used in the case studies include providing impartial legal assistance to local stakeholders for contract negotiations and providing technical assistance to strengthen farmer interest and participation in out-grower models.